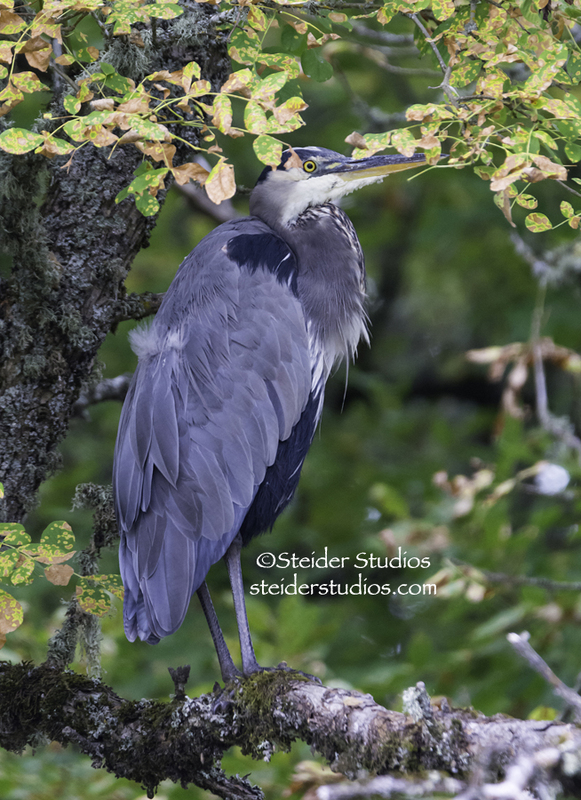 September 20th I participated in the Klickitat County Bird Count at Conboy National Wildlife Refuge, one of my favorite places. We arrived just as the sun rose on a cool morning with mist hanging in the air below the hills. An explosion of birds took off as I pulled my car into a sheltered spot – sorry, I didn’t mean to wake or alarm you! 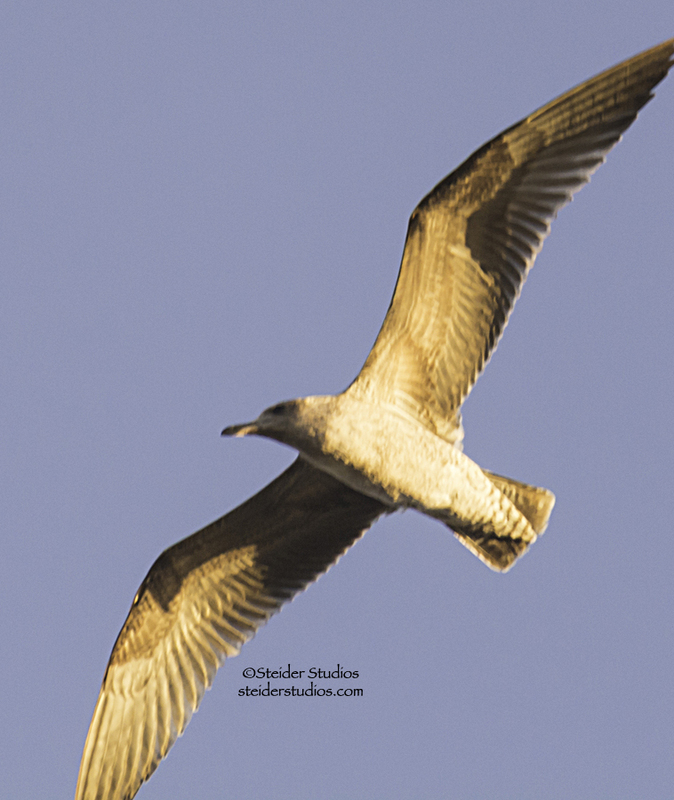 We counted over 300 birds, traversing just over 50 miles in 9 hours time. A long but very fun day with 1954 images on my memory cards! We saw 13 herons that we could count, but think there were more. Flying high in the sky, we could clearly see that two of those black silhouettes were Turkey Vultures. 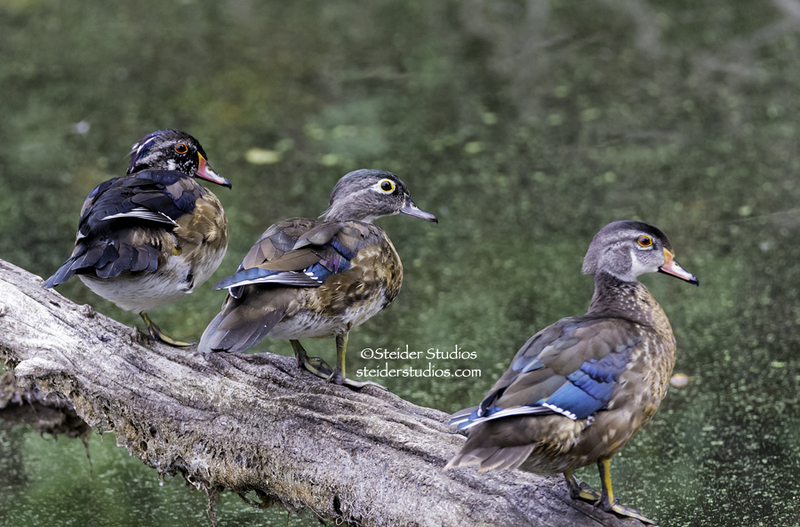 We counted three Wood Ducks – not these three, but aren’t they cute?!! 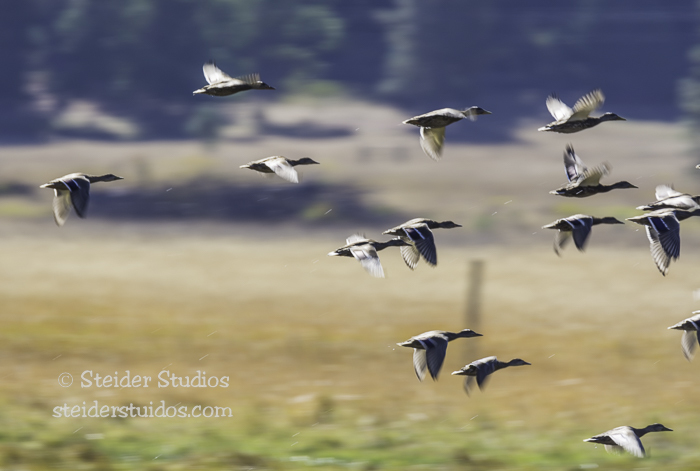 We watched several groups of Mallards take off – in one blurry photo that I blew up I counted 84! 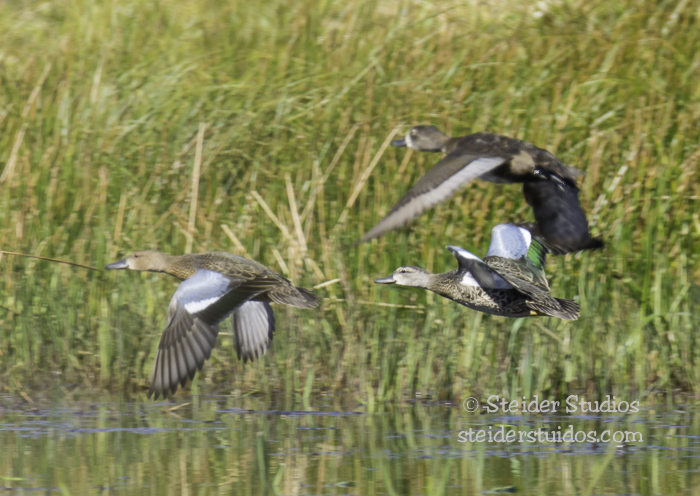 I do not know ducks so asked for help with these Green-winged Teal. Hope that’s what they are so I don’t mess up the official bird count with wrong identifications! We counted one Ring-necked Duck, but think we saw 3 more. I had help identifying her also, thanks so much to the Backyard Bird Counters! 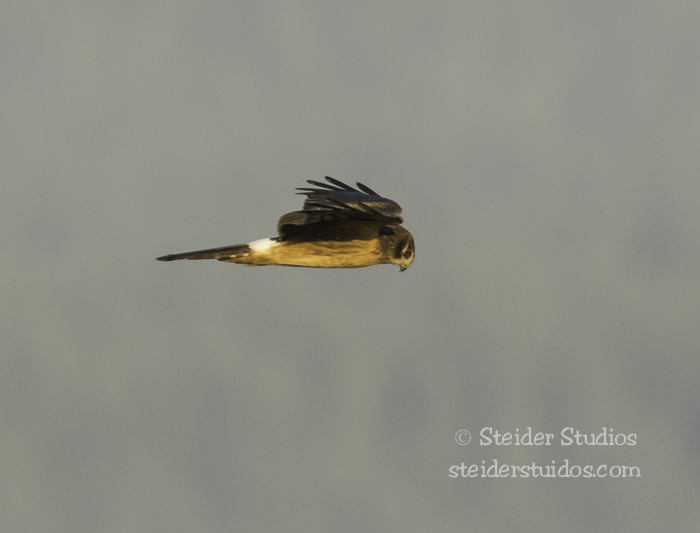 We watched 10 or 11 Northern Harriers hunt from the sky and in the marshes. 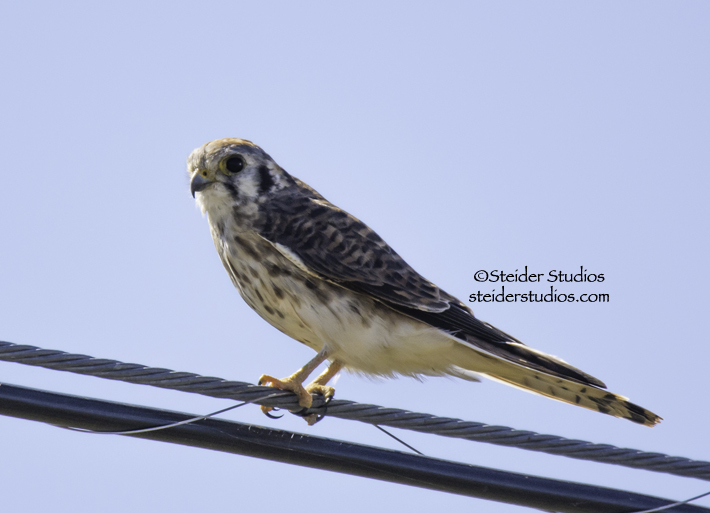 I spotted an American Kestrel on a utility wire with another on a stump nearby – love these little guys! 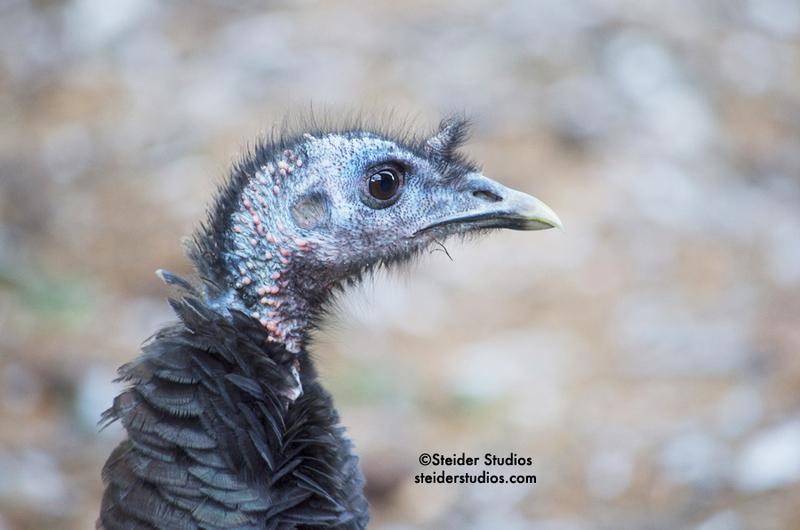 We saw 8 wild turkeys, but not until we were leaving, late in the afternoon. 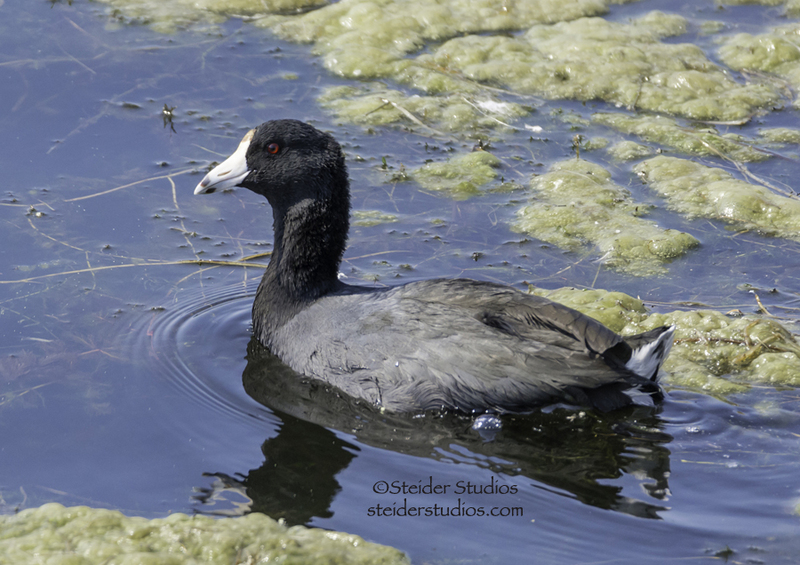 One American Coot identified, but there were probably more in the canals. 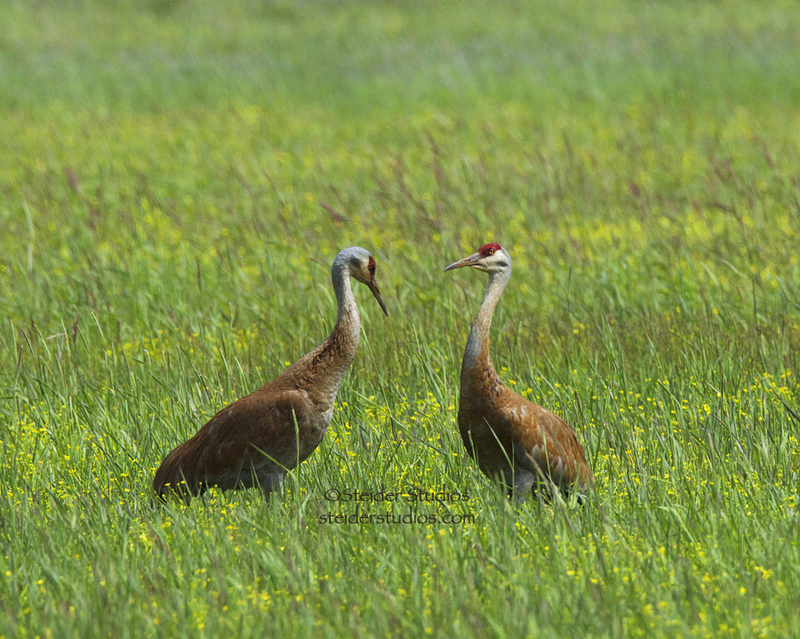 We heard 1 or 2 Sandhill Cranes but did not see them. 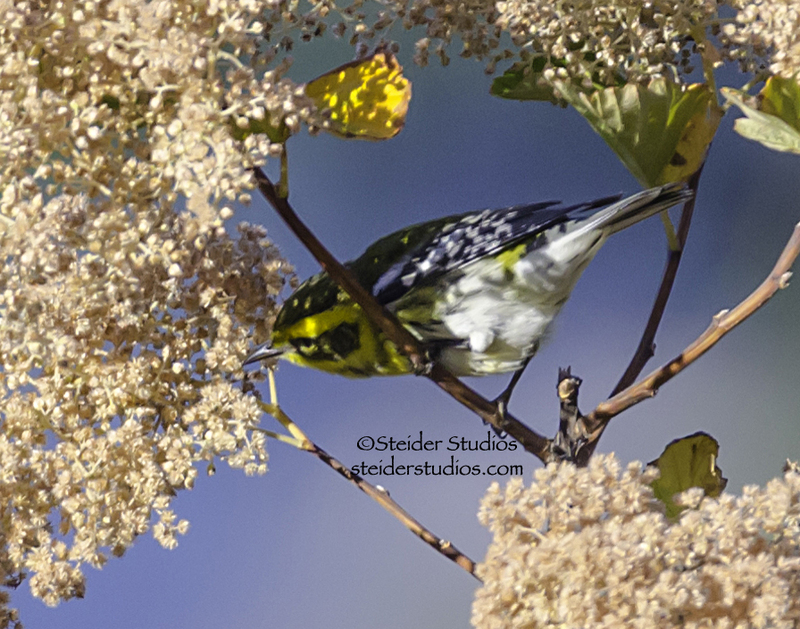 I’m hoping to see hundreds at Ridgefield’s Birdfest next weekend! Forgive this blurry shot, but I’d not seen a California Gull before! At least not here in the Pacific Northwest. As we waited quietly in the canal area hoping more waterfowl would appear we heard a loud rustling in the tall grass. 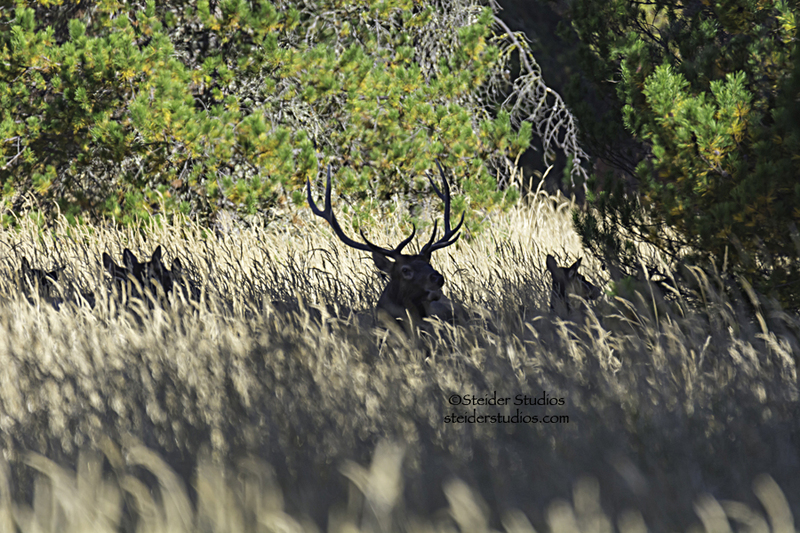 Much to our shock and awe, a herd of Elk appeared instead! We startled them as much as they startled us. 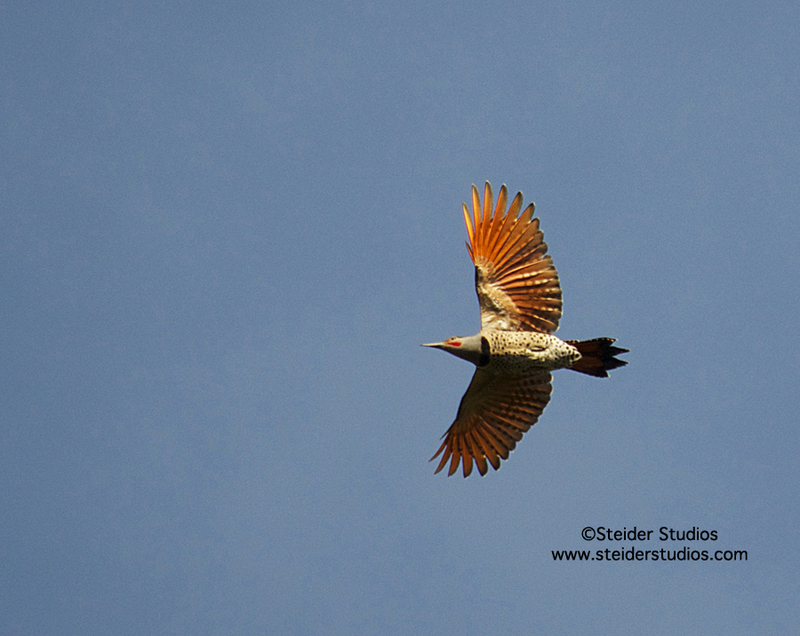 Our attention turned back to birds – six Northern Flickers tried to hide from us, but we spotted them. 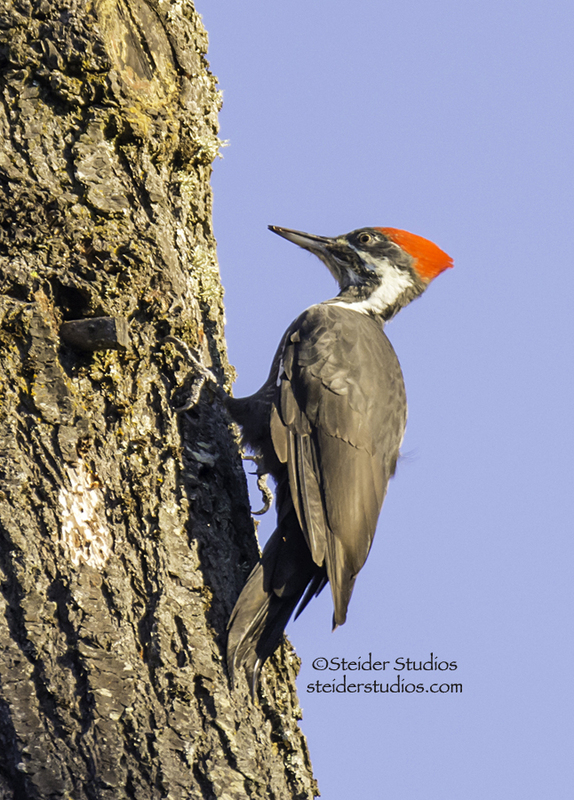 We couldn’t find, but heard 1 Pileated Woodpecker through the woods. This shot is a snag outside my back door. There were so many Ravens that again I had to blow up a blurry picture to count all 30 but I think there were more. American crows in the fields were just as plentiful, more than 40. 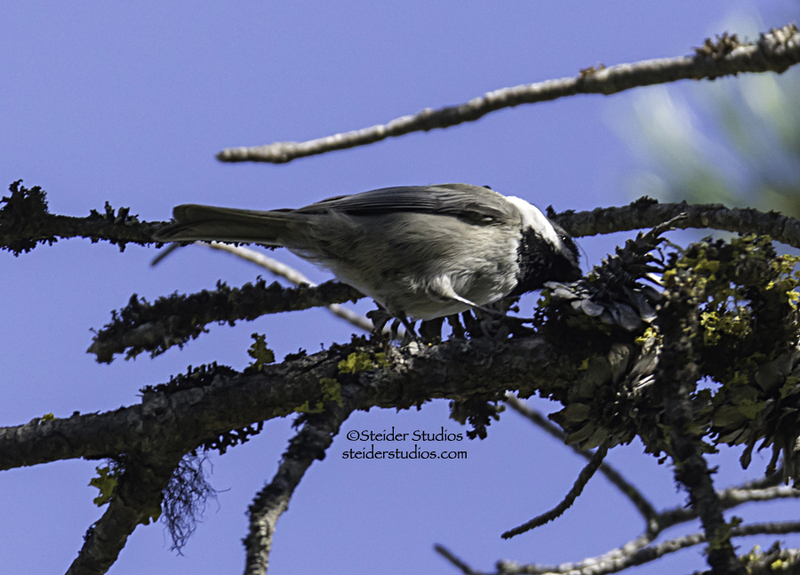 Three Mountain Chickadees were scampering from cone to cone. 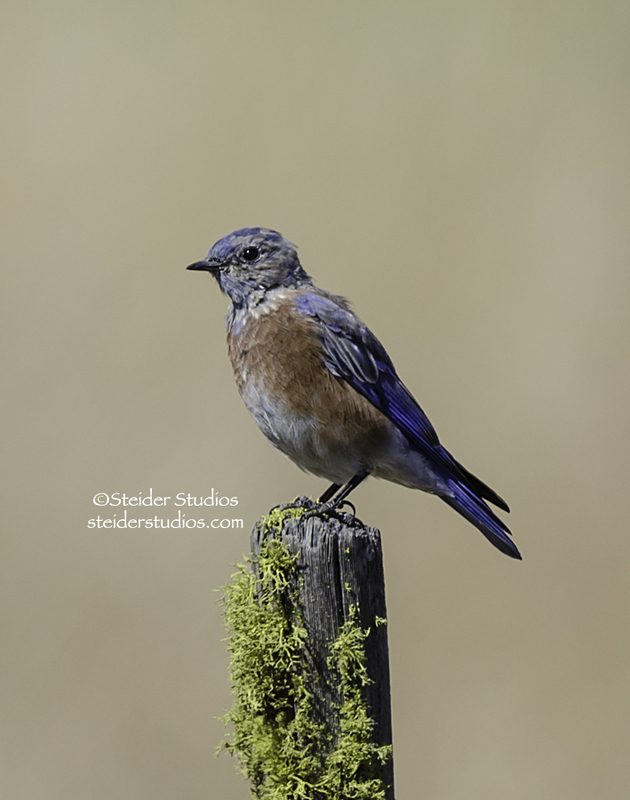 We counted four Western Bluebirds, but there were more that we couldn’t properly identify. 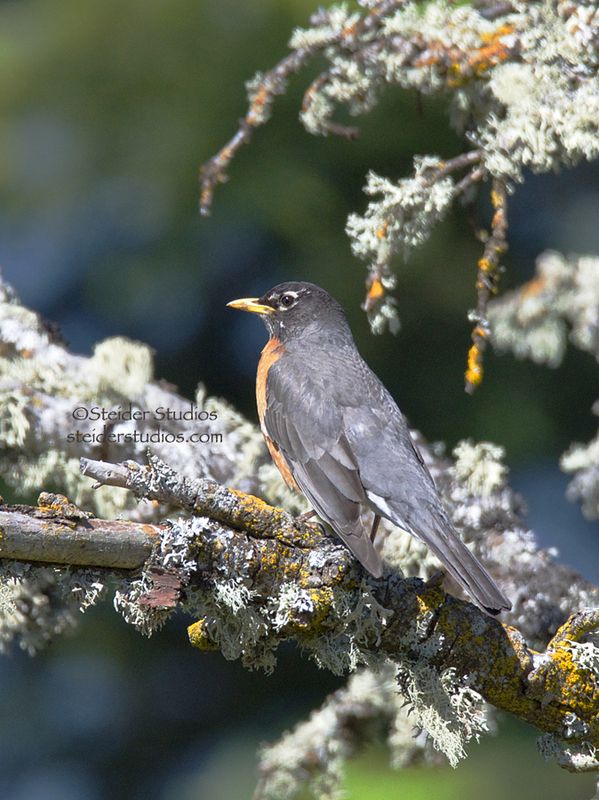 Only two American Robins presented themselves to us. 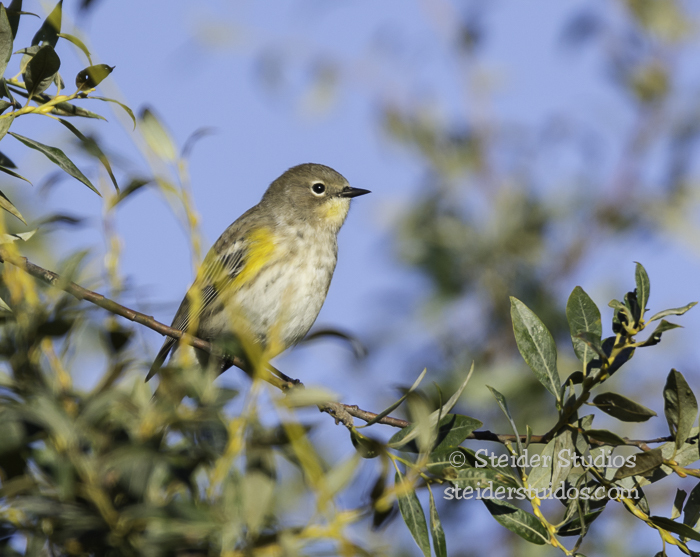 We counted nine sweet little Yellow-rumped Warblers. 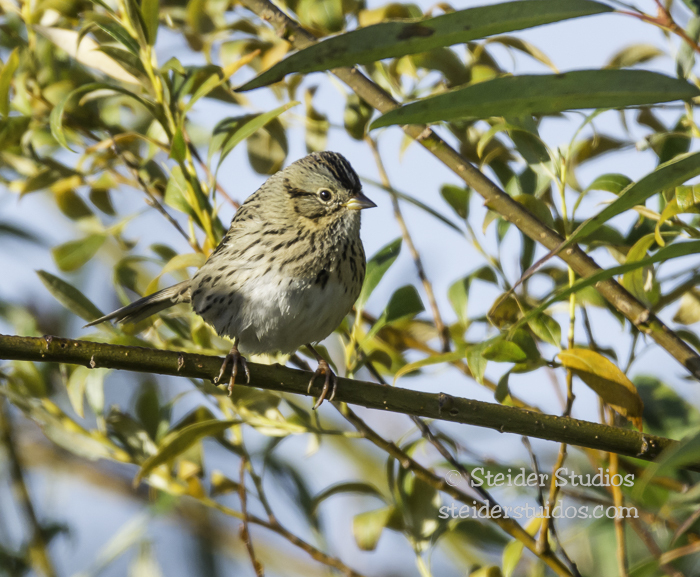 and more help with this Lincoln’s Sparrow. 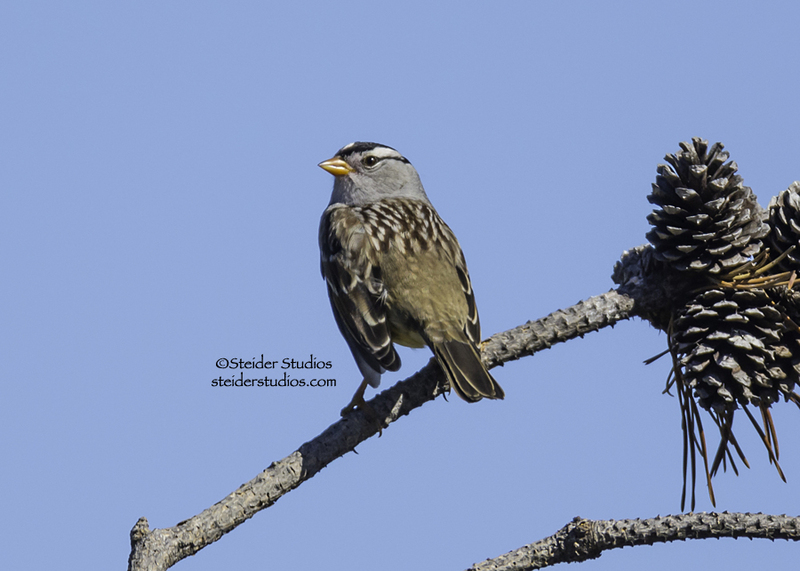 I DO know the White-crowned Sparrows because they’re in my garden. Maybe the others are too and I’ve been calling them finches!! 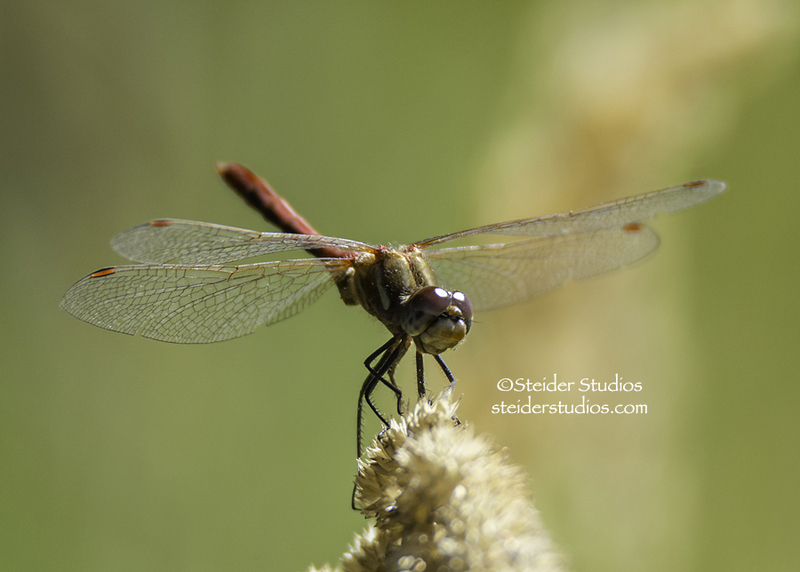 At the end of the day a swarm of dragonflies captured our attention and away we went on a new adventure…You can see more dragonflies in my Facebook album. Between our notes, photos, Peterson’s & Audubon’s field guides and help from birding groups on Facebook I finished our report and turned it in. Hoping to have helped in some small way even though we weren’t at all sure what we were doing! 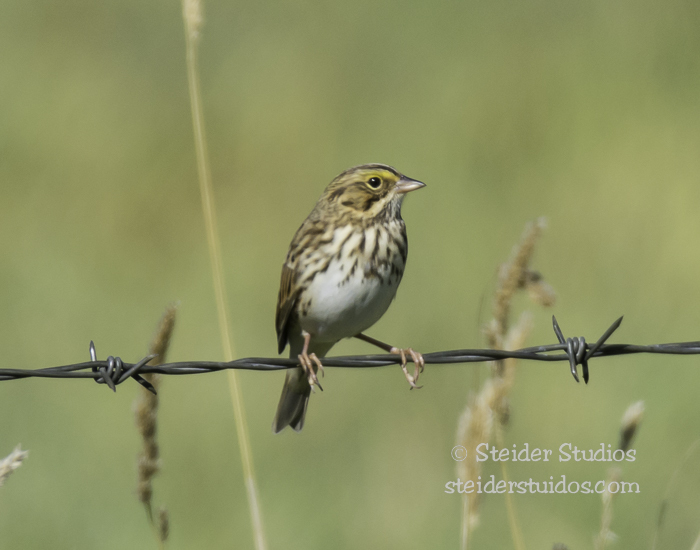 Over 300 birds within about 50 miles in 9 hours time…whew!! As I stepped out the door I heard an owl call from the fir tree directly in front of me. A second hoot responded from the neighboring fir tree. Then a third owl joined in their conversation from the next tree over! 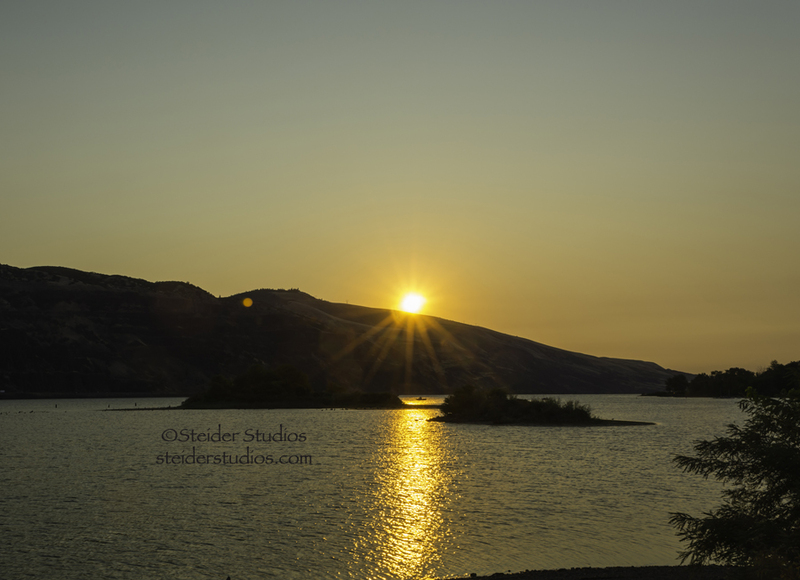 If I had not been in a race to meet the sun rising on the Columbia River, I would’ve grabbed a flashlight to seek them out. My date with the sun would not wait so I left the owls conversing and sped down the hill to meet my sunrise at Mayer State Park. My BirthDay is in September and I generally spend the entire month celebrating. One of my birthday gifts was a NEW CAMERA! So, after three hundred sunrise photos I headed to Lyle Point, a favorite birding spot to see how my new camera would capture birds. 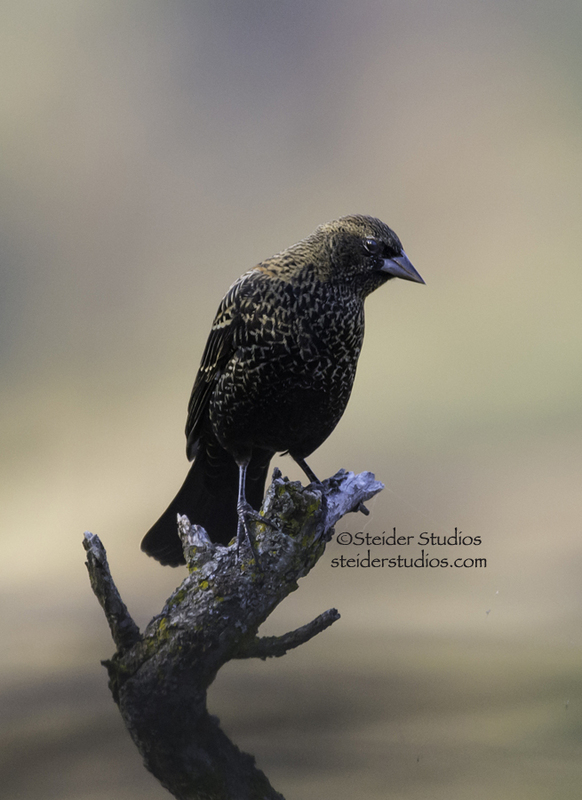 I watched this pretty Starling sitting on a snag observing his world for a while. 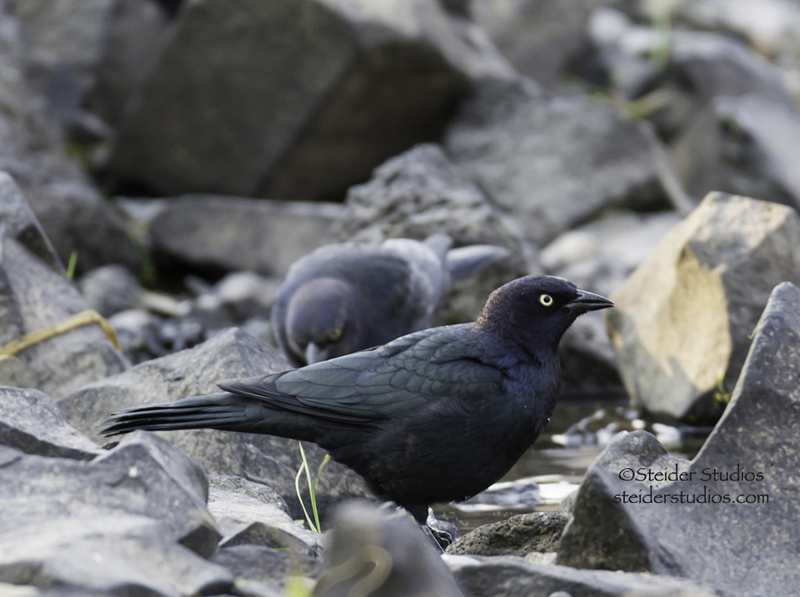 There were tons of black birds at Lyle Point – I am including the speckled Starling because from a distance they look black. 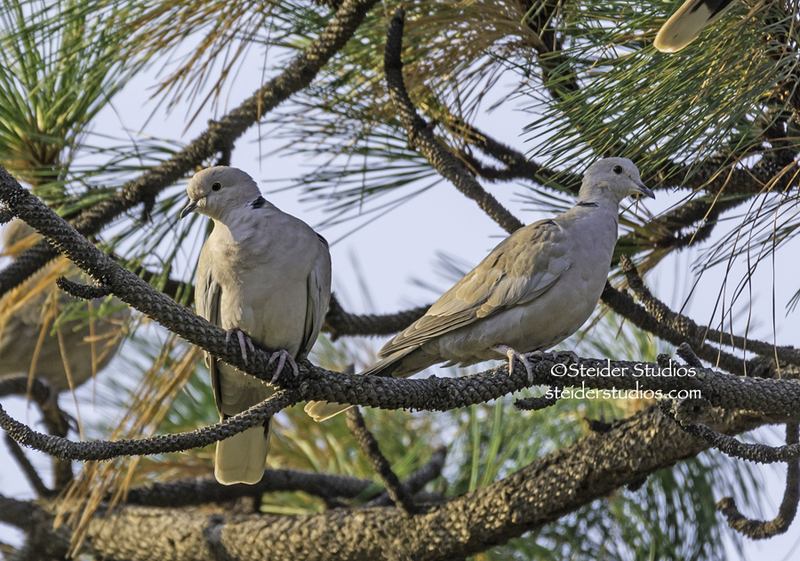 I watched a group of them flying through a pine tree, having a little pine cone breakfast. Trying to learn my new Nikon D-7100 while keeping up with the action was daunting at times. 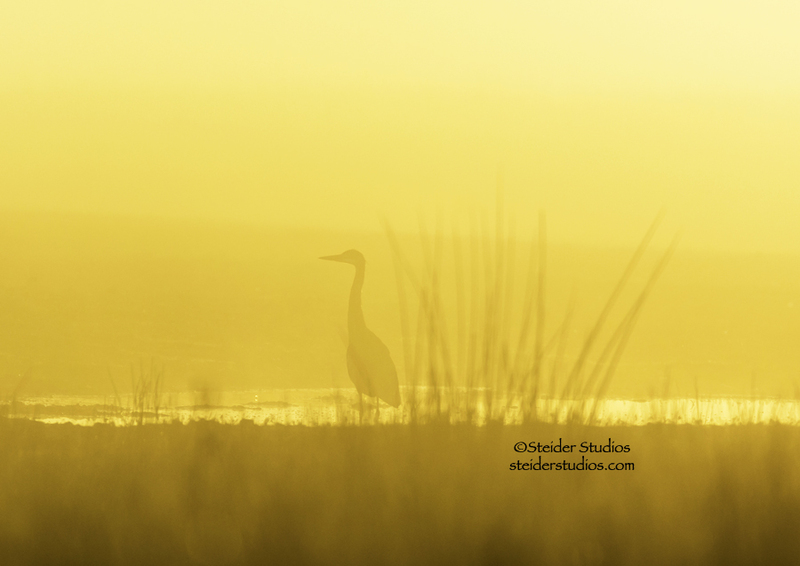 I was thrilled to have this bird pose for a minute. To our delight, we found a flock of Ringed Turtle Doves flying from tree to tree shortly after our arrival at Lyle Point. It was such a beautiful morning, windless, warm and the river was crystal clear and calm. By now, it is daylight and I can see all the buttons on my camera. Trying to learn and remember each button and it’s function! 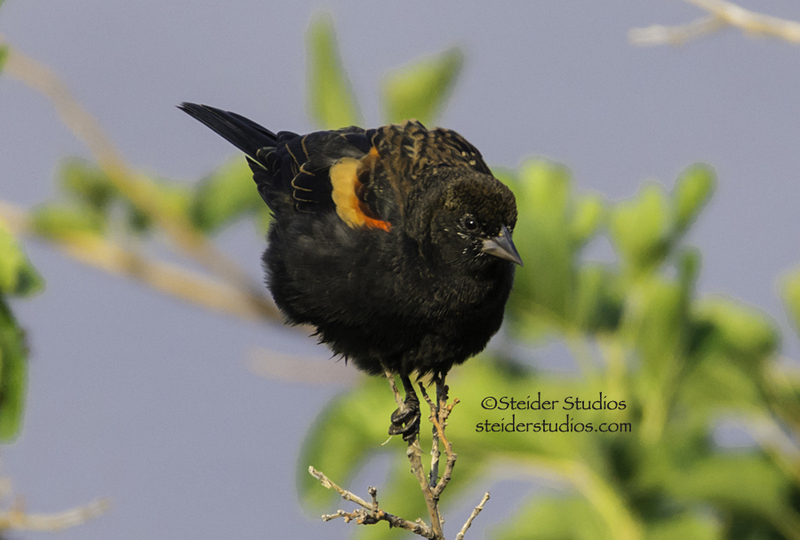 A Red-winged Blackbird landed on the top of a tiny tree and posed for just a minute. I think he was saying ‘Happy Birthday’ to ME!! 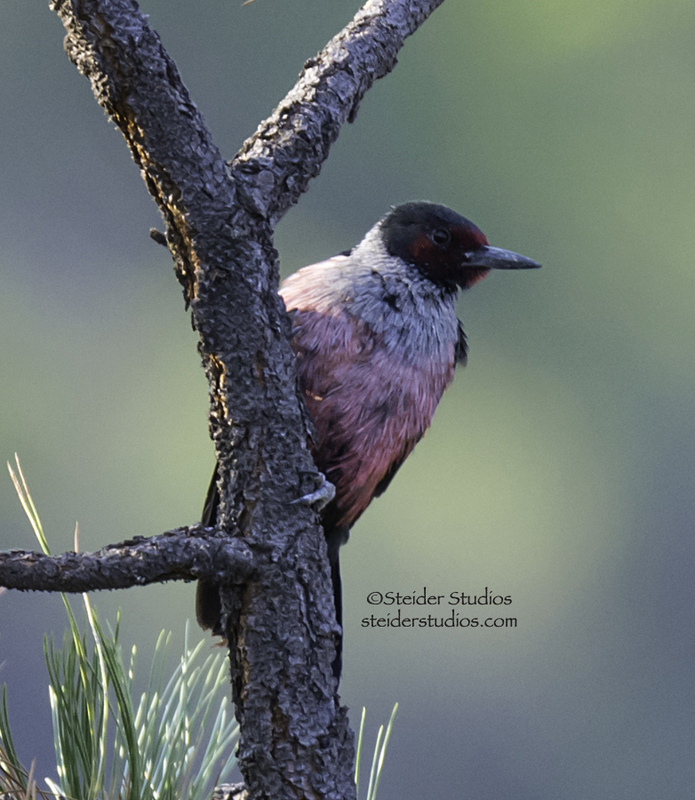 To my surprise, one of my favorite birds appeared for just a moment, a Lewis’ Woodpecker! I managed to get 3 shots of him before he skipped town. I followed in his path, but to no avail – he was gone or very well hidden. I love how iridescent the wings of a Brewer’s Blackbird are. 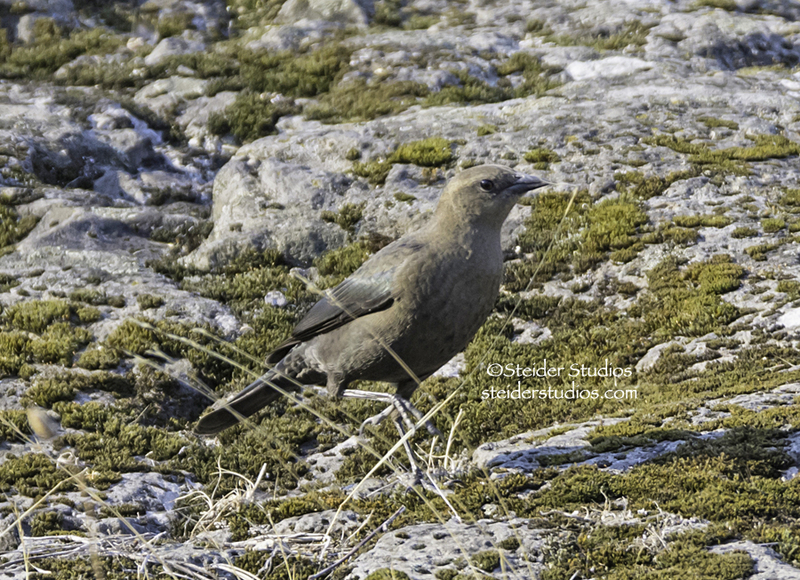 This is another black bird that I was unfamiliar with. We saw a lot of these, but they kept their distance and didn’t pose long. Yes, I needed them to pose because my 150-600 Tamron lens is heavy; and I am trying to learn my new camera! 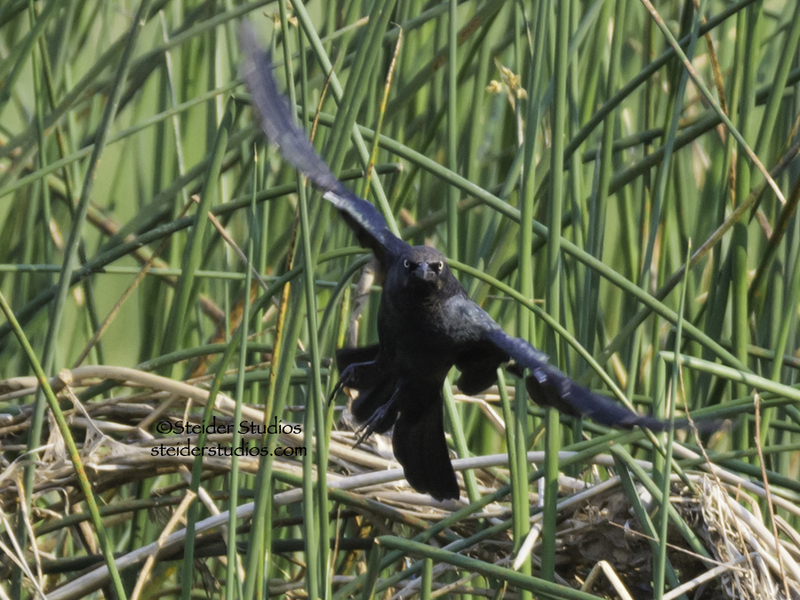 I think this is a Brewer’s Blackbird coming in for a landing, but I think I’m starting to get all the black birds confused. 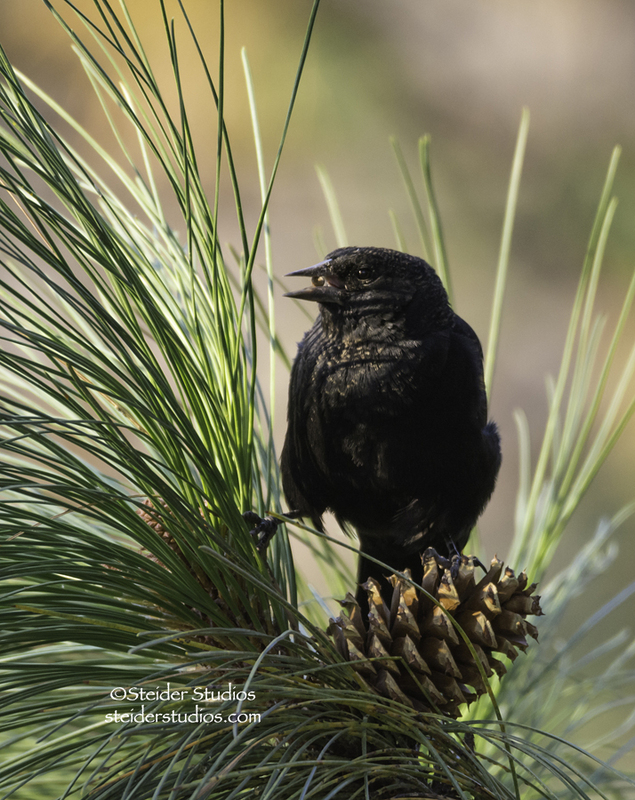 “This is a female Brewer’s Blackbird” she said as she put down her birding field guide to re-check her camera manual and re-read how to change the white balance and f-stop. Again. 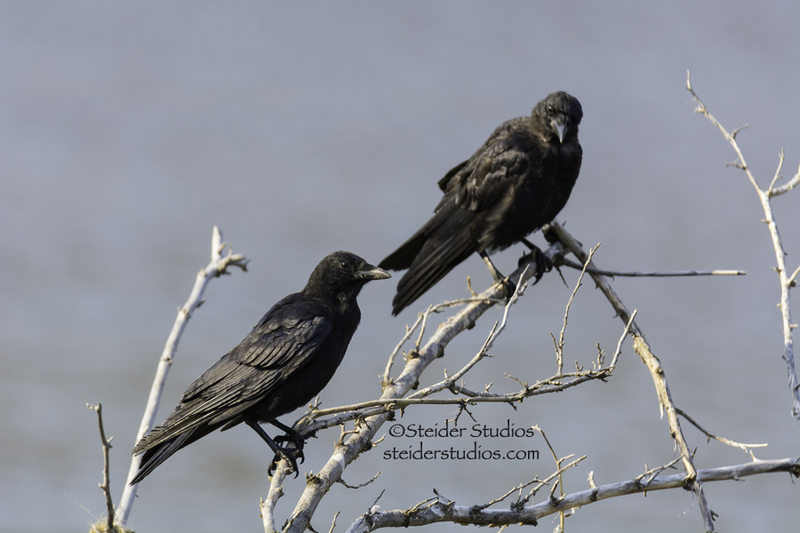 Although there were a few more black birds at Lyle Point yesterday, this is the last of the black birds I’ll show you. For now. 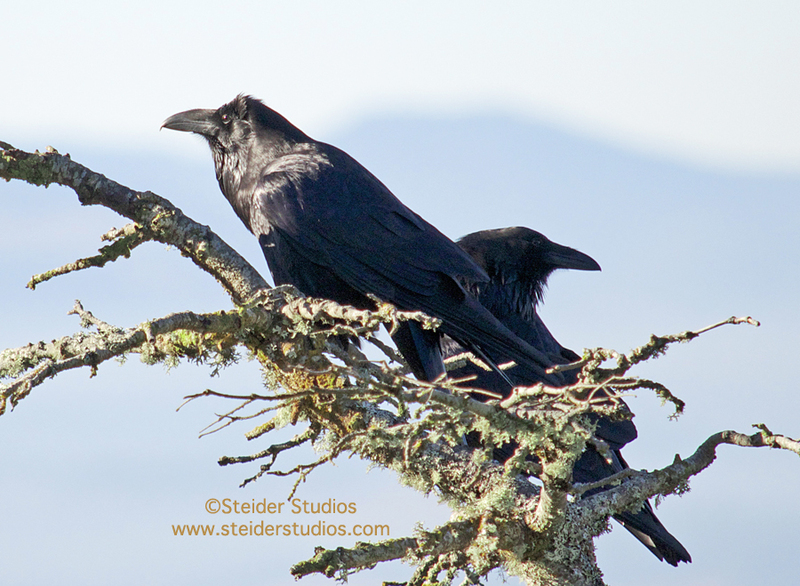 A pair of crows. I believe. Thankfully they were not in flight. Just posing on a snag for me. Where was that re-play button on my new camera? While we were in Lyle, we snapped some shots of the Cycle Oregon folks taking a break. And I re-read page 6 “The Mode Dial”. 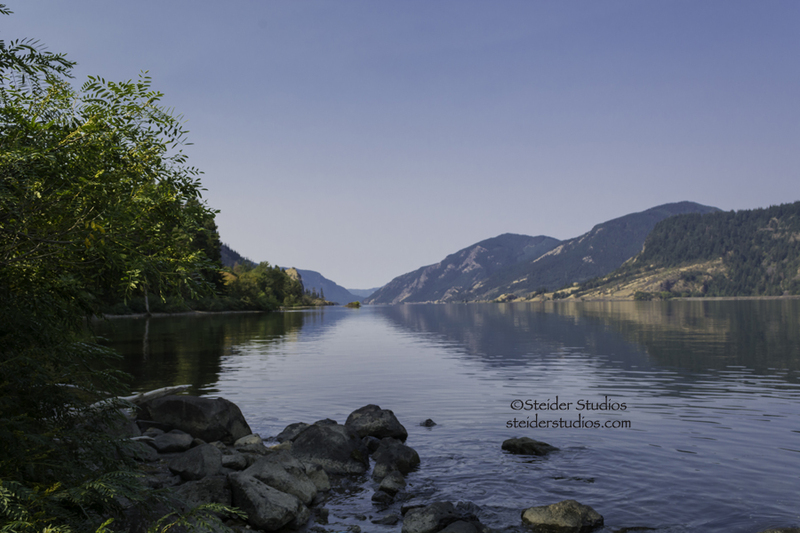 By late morning we found a cove on the Oregon side of the Columbia River. It was a stunning spot – calm, peaceful, restful. We took our time exploring. We found a few woodpeckers but they were in dense forest. 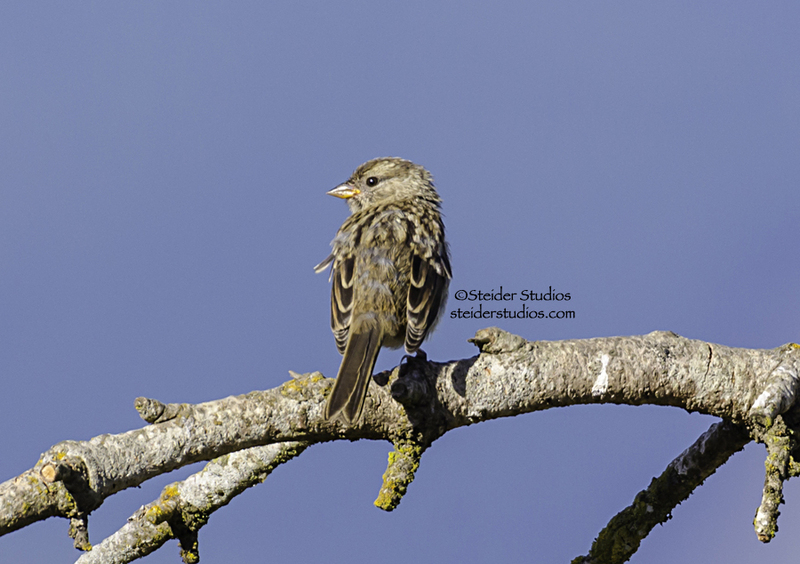 Instead I focused on this sweet Song Sparrow taking a bath in the Columbia River. 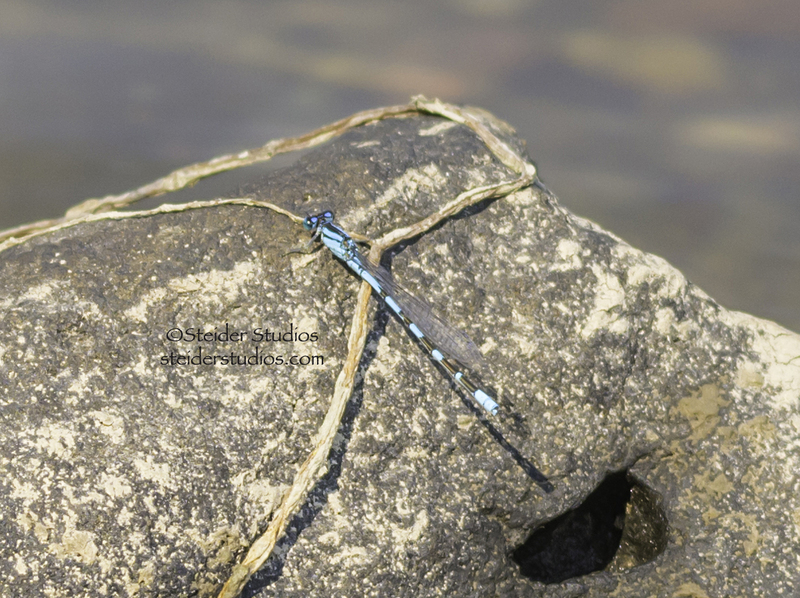 A blue Dragonfly resting on a rock – I had my lens locked and by the time I unlocked it the dragonfly was gone so I only snapped this one shot of him. A late summer picnic lunch, then we were off to our final destination for the day. 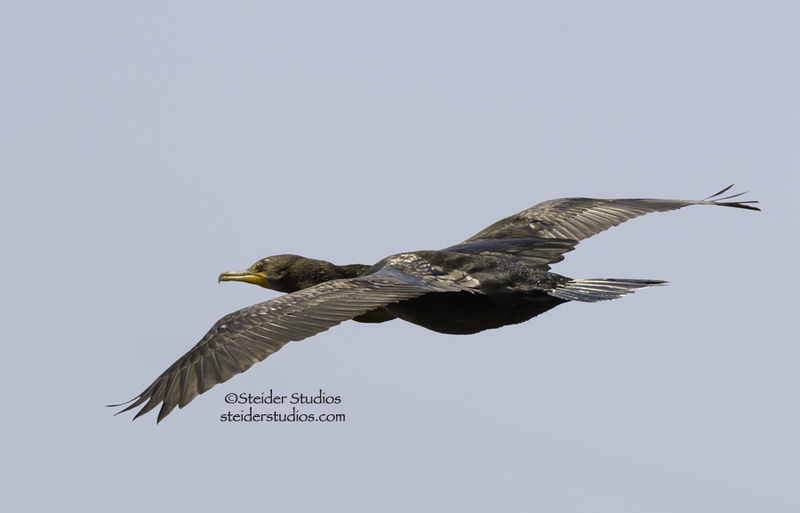 As we arrived at the Bingen Marina, a Cormorant flew by and I managed to grab this shot. 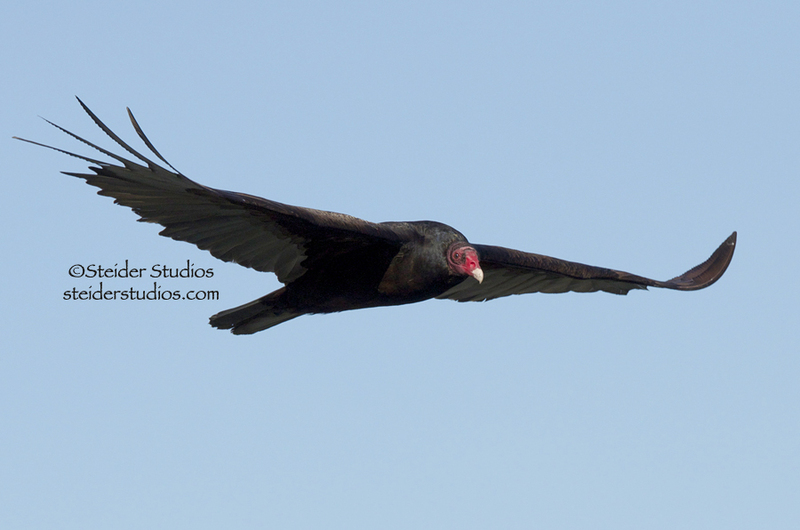 He was flying low and slow just for me. And my new camera. He landed on a piling and we meandered over to watch him and his friends bask in the sun. I know it’s a matter of ‘practice, practice, practice’ and my new camera will become as comfortable as my (barely) old camera, but I want to learn everything now. Right now. Today! There were a ton of Mallards at Bingen Marina, but this Coot was a nice contrast and an interesting duck for me to practice with my new camera. I’ll be out and about almost every day this month, so if you see me, stop & say hi. I love my BirthDay month! And my new camera!! 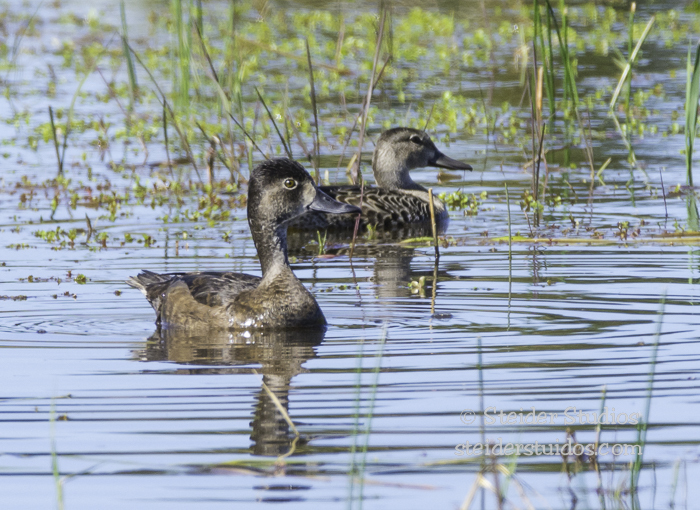 I have new photos from Ridgefield and Conboy Wildlife Refuges to show you too! As soon as I process and ‘tag’ them in my still ‘new’ish’ LightRoom Program. Yet another learning curve I’ve been playing with! Happy September, My Favorite Month!! September is my favorite month, it’s still summer, still warm and my garden is full of color. Birds and wildlife abound and I take a daily hike. 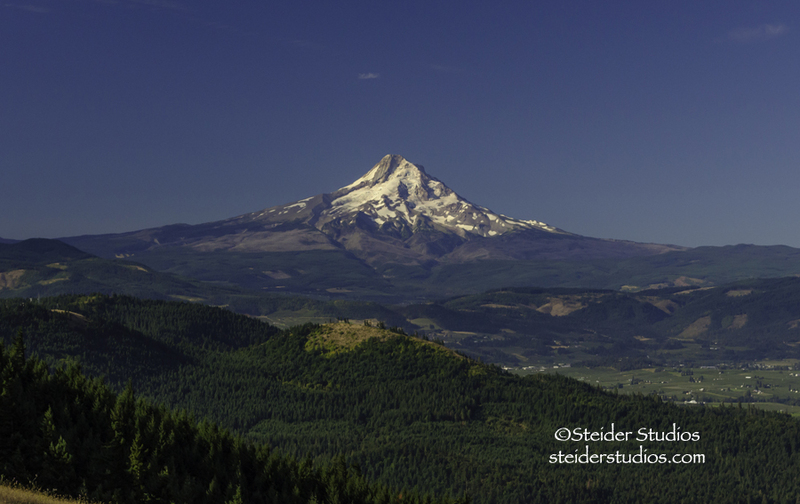 I entered the photo above in Daily Depiction of Nature’s photo contest. 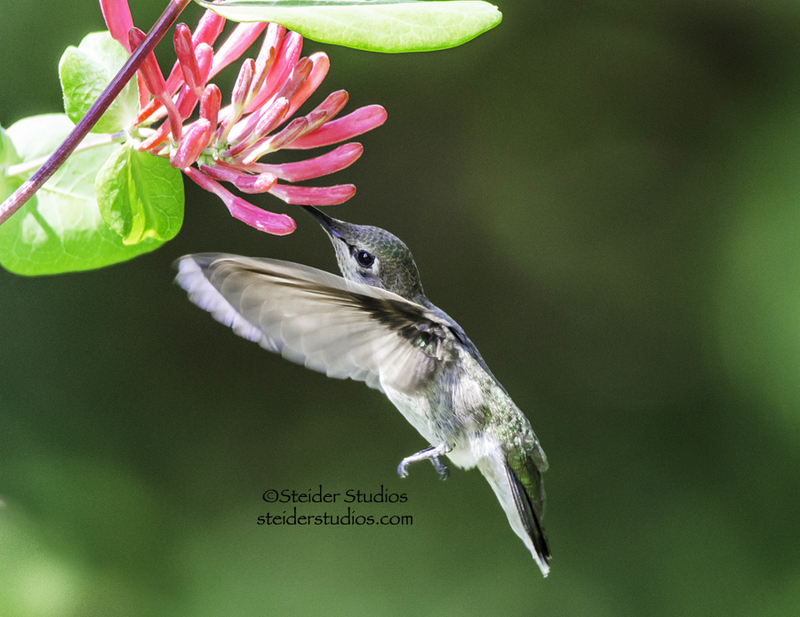 I would love it if you’ll take a moment and vote for my Hummingbird in Honeysuckle image. You can use this link, for an easy and fast vote. Wildfires have finally died down and our skies are clear. 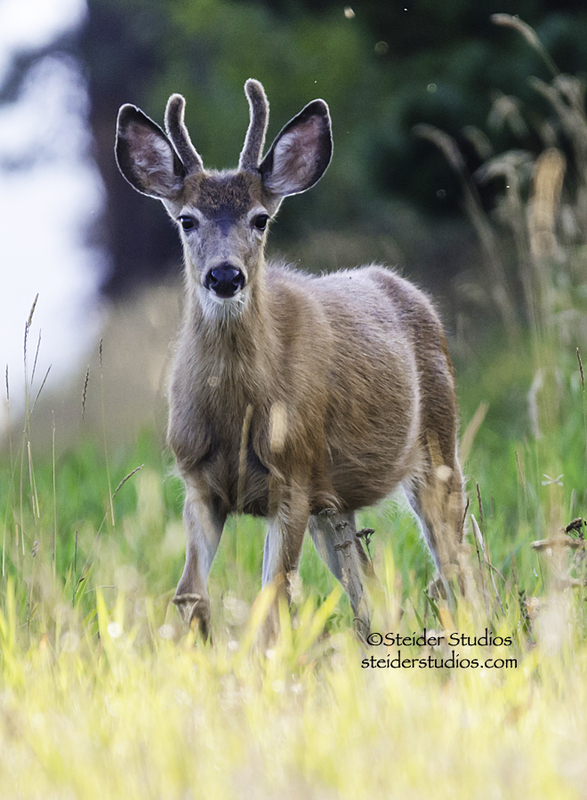 I find my way to Conboy National Wildlife Refuge often, hoping to see more wildlife like this sweet buck …. 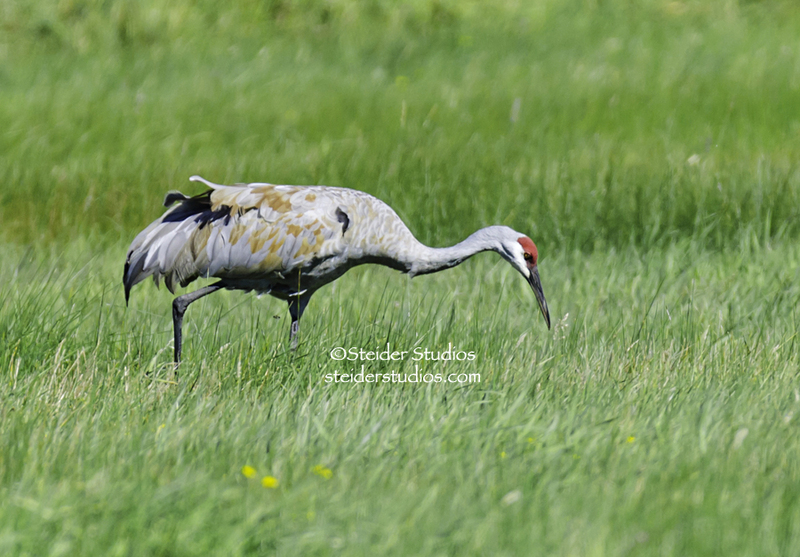 …and Sandhill Cranes to share with you. 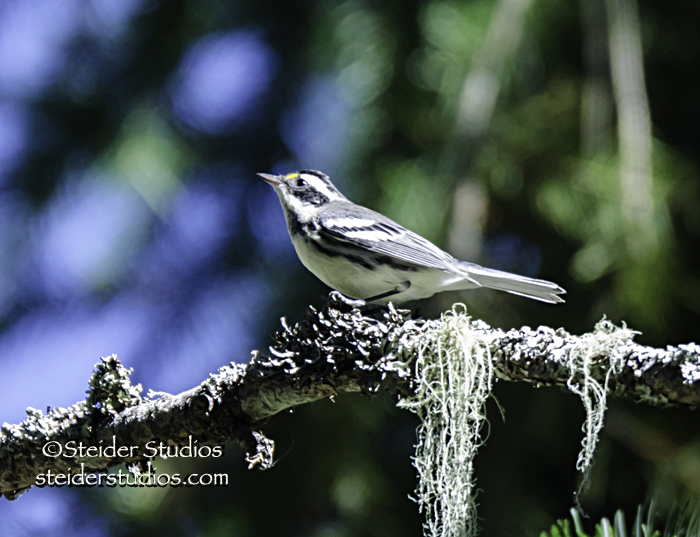 Bird migration has started so I’m seeing interesting new-to-me species of birds like this Black-throated Gray Warbler …..
…and this Townsend’s Warbler on my daily hikes at home. So, Happy September, I have to get going, Treasure is pulling her leash out! Enjoy the last days of summer and if you’ll take a moment to vote for my hummingbird image at the top of this post, I’d really appreciate it. Voting closes Sunday, Sep 7th, here’s the link again, for an easy and fast vote!